Collect data to track the success of your ELO program with surveys for teachers and students. Complete these surveys after each ELO is complete. 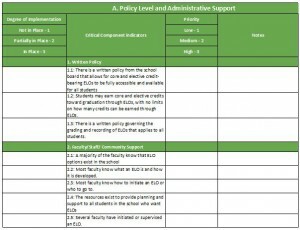 The Next Steps NH project developed an ELO Practice Profile (PDF, 6 pages) to guide an annual assessment of the quality of your school’s ELO process. 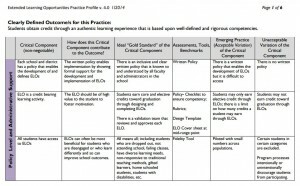 A practice profile lays out critical components for successful ELO program implementation and provides examples of unacceptable variations, emerging practices and the ideal “Gold Standard” for each component. 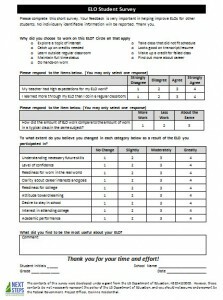 Use the results of your annual self-assessment to develop goals and plans to further improve the quality of ELOs at the school. The Minimum Standards checklist (MSWord, 2 pages) will help you assess your ELO program against NH Minimum Standards, Section 306.27 (b). The Best Practices Checklist (PDF, 5 pages) will help you assess where your school is compared to both compliance with NH Minimum Standards, and the more rigorous best practices. This tool pre-dates the ELO Fidelity Tool. A fidelity tool helps you figure out your starting point (needs assessment) and track your progress by having you periodically assess where you are compared to clear goal statements. 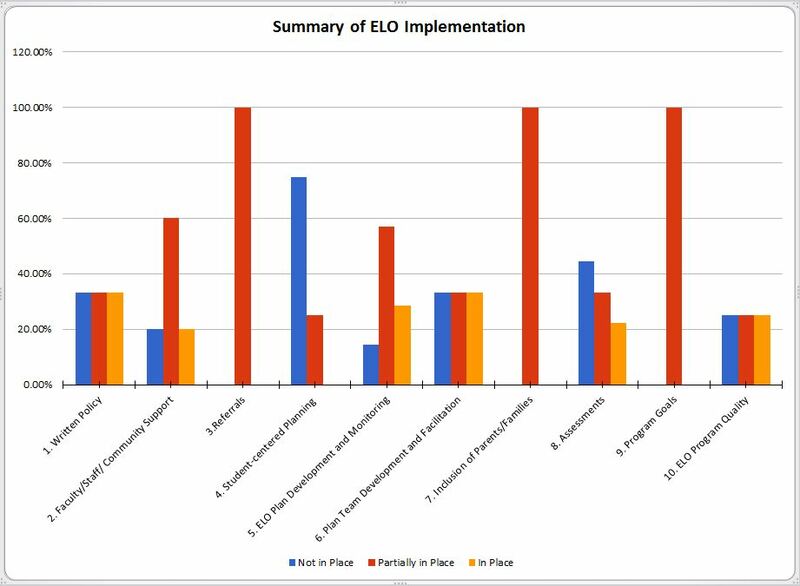 The ELO Fidelity Tool is a data system developed by the Next Steps NH project for tracking school progress in implementing ELOs, based on the ELO Practice Profile. The tool will help schools track implementation progress across practices, as well as track implementation over time. 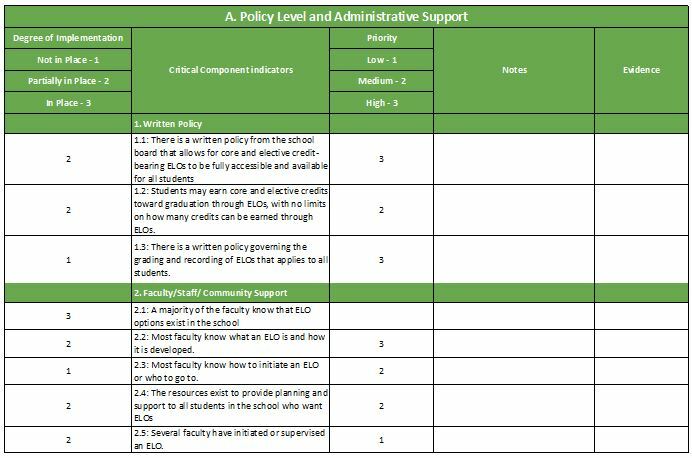 We recommend convening a team to complete the ELO Fidelity Tool using a consensus model to determine the actual degree of implementation. The ELO Fidelity Tool is an Excel file with four worksheets to complete. The last worksheet automatically shows your data in summary form for easier understanding and to track your progress.